This species is accepted, and its native range is Ethiopia to S. Africa. Tufted perennial with erect culms 50–200 cm. high. Leaf laminae 15–50 cm. long and 2–10 mm. wide, acuminate. 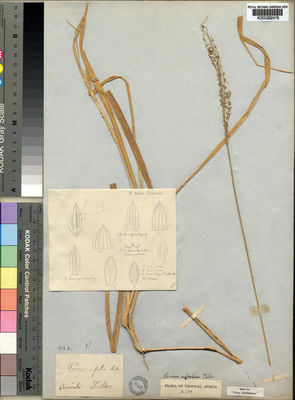 Panicle 10–28 cm. long, oblong, secondary branches very short or absent. Spikelets 2.5–4 mm. long, oblong, glabrous, sulcate on the dorsal side; inferior glume broadly ovate, 1/4–1/3 the length of the spikelet, 1–3-nerved; superior glume 5-nerved; inferior lemma 5-nerved, male, its palea well developed; superior lemma transversely rugose. Perennial; caespitose. Culms erect; 50-200 cm long. Leaf-sheaths wider than blade at the collar; glabrous on surface (rarely), or hispid; with tubercle-based hairs. Ligule a ciliate membrane. Leaf-blades 15-50 cm long; 2-10 mm wide. Leaf-blade surface glabrous (rarely), or pilose; with tubercle-based hairs. Leaf-blade apex acuminate. Inflorescence composed of racemes. Racemes 7-10; borne along a central axis; 7-12 cm long; simple, or secondarily branched; secondary branches racemulose, or glomerate. Central inflorescence axis 10-28 cm long. Raceme-bases brief; pubescent, or pilose. Spikelets solitary. Fertile spikelets pedicelled. Spikelets comprising 1 basal sterile florets; 1 fertile florets; without rhachilla extension. 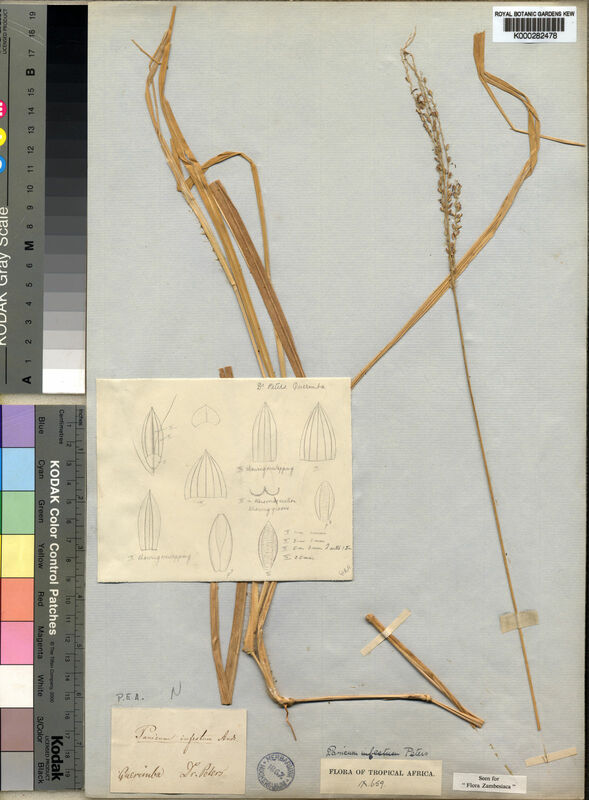 Spikelets oblong; dorsally compressed; 2.5-4.1 mm long; falling entire. Glumes dissimilar; reaching apex of florets; thinner than fertile lemma. Lower glume ovate; 0.25-0.33 length of spikelet; hyaline; without keels; 1-3 -veined. Lower glume apex obtuse. Upper glume oblong; 1 length of spikelet; cartilaginous; without keels; 5 -veined. Upper glume apex obtuse. Basal sterile florets male; with palea. Lemma of lower sterile floret similar to upper glume; oblong; 1 length of spikelet; cartilaginous; 5 -veined; sulcate; obtuse. Fertile lemma oblong; dorsally compressed; 2.5-4 mm long; indurate; pallid; without keel. Lemma surface rugose. Lemma margins involute. Lemma apex obtuse. Palea involute; indurate. Palea surface rugose. Africa: west-central tropical, northeast tropical, east tropical, southern tropical, and south.